Lightning Fast – excellent for those occasions when you might possibly want to carry your flash gun just in case. Takes my Canon Speedlite 550EX and the off camera cord. Full information on all of these separate components can be found on the company website (link below). I was not surprised to find that the kit with all the components was made to Think Tank’s usual high standard that I have seen in their other products. The box is literally filled with goodies that will keep you entertained for hours just checking them all out with the different possible configurations. After several months of intensive use, including on photo shoots abroad, I’ve becme more and more dependent on this system. I just love its versatility and the way it integrates with the Rotation 360 and my Speed Freak. The belt is bought for a specific waist size and the instructions for measuring are quite clear on the site – you MUST measure over the top of your usual clothing. Do not use your normal waist size or you will find it’s too small. In a store you can try it out for size, but with mail order this is more critical. As many of my regular readers know, I am frequently shooting in performance venues and often in crowded situations at sell-out shows – sometimes with standing room only. 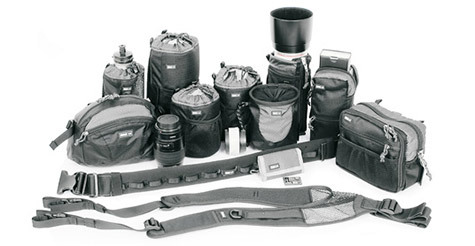 While I usually use my beloved Speed Freak – my first introduction to the Think Tank products – I was hoping that this Pro Modulus Speed Set would be a more streamlined way to carry my lenses and other needed items. This would enable me to move through the crush of the crowds more quickly and still have everything I might need to hand. I found that it was everything I hoped for and it has taken the place of my Speedfreak for this kind of photography. I have really got the feel of using this at my performance shoots since I received it in the Spring and I have not been disappointed for these assignments. For my own needs on these occasions I have mostly worn the Speed Changer (see photos below), the Lens Changer 25 and 50 as well as the Whip It Out. My spare Flash Cards were in the Pixel Pocket Rocket that is attached to the inside of the slim Speed Changer by a removable strap. 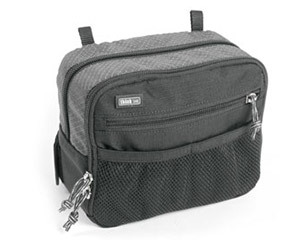 In this I was able to carry business cards, my promotional CDs, pens, model releases, spare batteries and basically all the usual things that make a photographer feel secure, with plenty of room to spare for snacks, sandwich, wallet etc. I am typical of many photographers, I think, in that I never like to leave anything behind, just in case I need it. This system allows me to pander to this paranoia and know that whatever situation presents itself, I will be ready for it at a moment’s notice. The fact that my equipment (except for my camera which is always is my hand when I’m working) is slung around my waist on the Belt means that the weight is evenly distributed, easy to carry and never inhibited my movements. 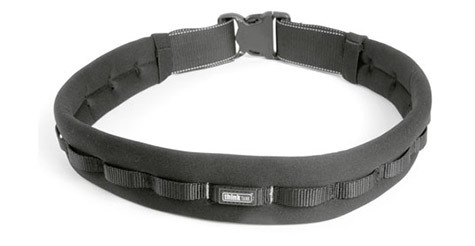 If you are carrying just a few items on the belt you probably don’t need to attach the Pixel Racing Harness, but in situations where you are carrying more weight or for longer periods, this will help to distribute the weight between the shoulders and waist, for added comfort. My only issue with this component is the inability to put it on and remove it quickly. It attaches very securely, but I would have liked a quick-release fastener that enabled you to attach and detach it quickly and easily. The plethora of components include some that will get used less frequently than others, depending on the photographer. There is the option to purchase these all separately, so building your system precisely to your needs. However, the cost saving on buying this as a complete set is considerable and does ensure that, should your needs change over time or for a specific situation, you have everything you might need. The components also fit on a regular belt, which is another great advantage. One of my favourite components is the Lightning Fast (below) which is excellent for those occasions when you might possibly want to carry your flash gun just in case. 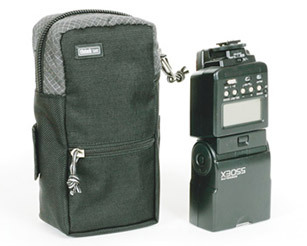 Takes my Canon Speedlite 550EX and the off camera cord as well as spare batteries. Another is my old friend the Whip It Out, which I have already reviewed. Now I have two – one for the bottle of Champagne and one for the lens. The components on this Speed Belt can all either be locked into position or left to rotate freely around the belt, according to your specific requirements. I like using it with them able to freely rotate so that I can pull the bags I need round to the front, then rotate them out of the way when I am finished. When going through small spaces, you can push the bags to the back making yourself more streamlined as you move through a crowd for example. Highly configurable – It fulfills a need superbly. All of the Modulus components can be used on many of their other bags including the Rotation 360º as additional carrying space, and can even be used attached to a regular belt. Seamless rain covers for everything. Guarantee described as “No Rhetoric Warranty” which is not mentioned in any of the literature that comes with the system but is available on the website and is a lifetime one. Lack of a quick release fastener on the Pixel Racing Harness. Some of the components still have the little tied cords on the zippers that I mentioned in my previous reviews. You have to make sure that they are really tightly tied, as some are not when it arrives. Once tightened they seem to be pretty secure, but I check them from time to time. Can’t think of any others! A great system that I will definitely be using for many years to come. Its versatility and configurability make it a sound choice for the serious professional and enthusiast photographers alike.